Which team came out on top following this season's winter meetings? Had it not been for the Angels, this week’s baseball winter meetings in Orlando would have been a bore, the equivalent of watching CSPAN TV. But general manager Jerry Dipoto’s willingness construct a trade that brought two young pitchers to Anaheim in exchange for his best power hitter saved the week. It took some daring, but virtually any trade involves a risk – and the Angels were willing to take it. The Dodgers? Well, they’ve been on a treadmill of sorts, running hard but getting nowhere. It doesn’t mean they won’t pull off a deal this winter - in fact, they have to – but so far, their activity has been minimal. Additions: third baseman David Freese and pitchers Joe Smith, Hector Santiago, Tyler Skaggs and Brian Moran. Subtractions: Peter Bourjos and Mark Trumbo. Evaluation: For a team whose problems last season centered on pitching, the Angels have done pretty well. Santiago and Skaggs are tentatively part of the starting rotation, but the Angels could still pursue another starter, possibly free agent Matt Garza. Smith and Moran, who was acquired from the Toronto Blue Jays on Thursday, provide depth in the bullpen, and Santiago, a left-hander, could be used as a swingman. 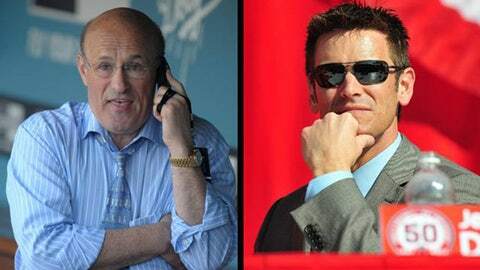 The Angels already filled a need in trading Bourjos to St. Louis for Freese, so their two big deals cost them a pair of young stars. But that’s the cost of improving. Additions: Pitchers Dan Haren and Seth Rosin and infielder Alex Guerrero. Subtractions: Pitchers Ricky Nolasco, J.P. Howell, Ronald Belisario, Chris Capuano, Edinson Volquez and Carlos Marmol and infielders Juan Uribe, Mark Ellis, Nick Punto, Skip Schumaker and Jerry Hairston Jr. Evaluation: The Dodgers still have time to fill their needs, which are plenty. Uribe could return to third base if he’s willing to sign a one-year deal, and Ellis remains an option at second if Cuban defector Guerrero has trouble transitioning to the big leagues. GM Ned Colletti is still looking to replenish his bench and add another couple of arms to the bullpen, but re-signing Brian Wilson as a setup man was a brilliant move. The decision not to trade one of the team’s outfielders, especially Matt Kemp, was smart. Haren should fit in nicely at the back end of the rotation, but will the Dodgers also pull the trigger to get David Price from Tampa Bay? Probably not if it costs them their best prospects.